Steenbergs Organic Cayenne Pepper is a pure chilli product with a consistent chilli heat in the range of 38,000 – 50,000 Scoville Heat Units. 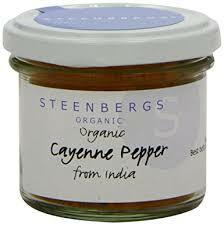 Steenbergs Organic Cayenne Pepper has the power to make any dish nice and hot, but it also has subtle flavour-enhancing quality. For a zesty change, add Steenbergs organic cayenne to replace paprika on devilled eggs or potato salad. Steenbergs organic cayenne pepper is from India or Uganda.